Nonstick pans are a staple in many homes. Allowing cooks to eliminate the process of greasing the pan before and during cooking, these pans save both time and money. They are not, however, a foolproof cooking method, and even the most savy cooks have been known to burn a nonstick pan from time to time. 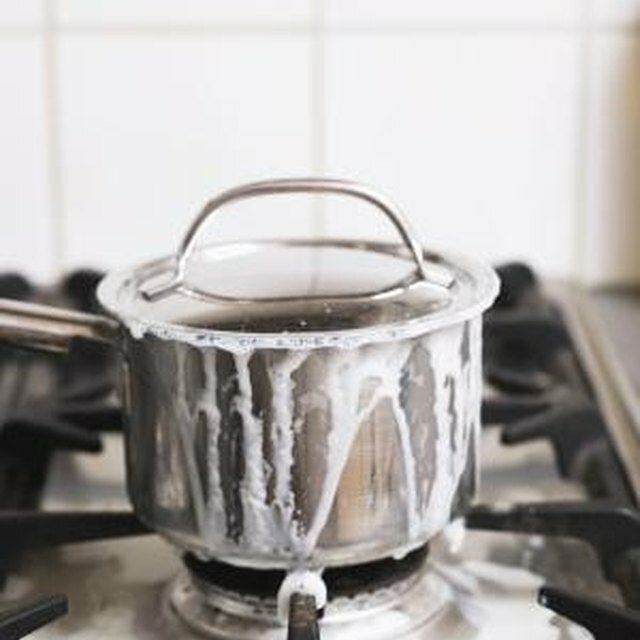 Although sometimes a nonstick pan cannot be salvaged once it is burned, it is possible to remove a burn from nonstick cookware with a simple homemade paste. Nonstick pans need care to maintain their usefulness. Mix one part baking soda with one part warm water in a small bowl. Use a small spoon to mix well and form a thick paste. Set the paste aside and allow it to sit at room temperature overnight. Wet the sponge in hot water and ring it out completely. Dip the sponge into the paste and gently scrub the entire pan. Dab the paste onto the specific burns and scrub the burns in a circular motion, using only mild pressure. Avoid scrubbing too hard, which may damage the pans. Rinse the pan in hot water to remove paste completely. Repeat all of the steps above as many times as needed if the burn is shrinking in size, until it is gone entirely. Pour one to two tablespoons of vegetable oil into the pan. Gently rub the oil into the entire surface of the pan with your hands to re-season the pan. Use a paper towel or soft cloth to wipe away any oil residue. Place the pan in a combination of hot water and some mild dishwashing detergent after use to loosen any stuck-on food particles. Use a wooden or plastic spatula to scrape away any particles that do not rinse off with hot water alone. Fill the sink partially with warm water and place the entire pan in the water. Wait two to three minutes for the pan to return to room temperature. Remove the pan from the water and gently wipe it clean with a soft cloth. Allow the pan to air-dry or gently wipe dry with a soft, dry cloth. Immediately store the pan in a cabinet, away from any objects that may scratch the nonstick surface.